The Cal Ripken Baseball leagues are youth baseball organizations named for former Baltimore Orioles star Cal Ripken, a Hall of Fame player who set a major league record by playing in 2,632 consecutive games. The Ripken leagues adopt most standard baseball rules, but they make a few changes to serve the youth community. The bases are 90 feet apart on standard baseball diamonds with outfield fences at least 300 feet from the plate. The Ripken leagues call for field sizes that suit the age of the players. The Coach Pitch and T-Ball divisions set bases 45 to 50 feet apart with fences about 150 to 175 feet from home. The bases are 60 feet apart and the fences no more than 200 feet in the Rookies division, for kids 8 and younger and the 10-and-under Minors division. The bases are 70 feet apart in the Majors division for players 12 and under. Mature arms have to pitch a ball 60 feet, 6 inches from the plate on a mound 10 inches high. In the Ripken leagues, the pitcher’s rubber is 6 inches high and 46 feet from the plate in the Minors division. The rubber is 8 inches high and 50 feet from the plate in the Majors division. 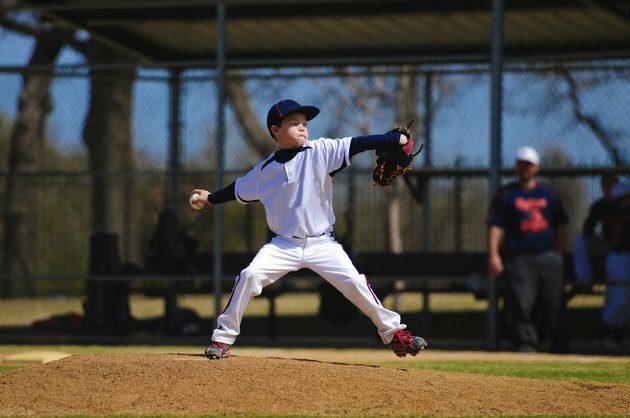 Unlike standard baseball rules, a Ripken League starter can leave a game and return once, although some local jurisdictions prohibit pitchers from re-entering the game to pitch again. The pitching rules are set up to protect young arms. Ripken League pitchers may not throw more than six innings in one calendar week, which begins Monday and runs through Sunday. Additionally, pitchers who throw at least three innings in a game can't pitch again for two calendar days. Leading off isn't allowed -- base runners have to stay put until the pitch reaches home plate. When a catcher drops a third strike, the batter can't run to first. Additionally, runners in motion must avoid what Ripken League rules refer to as “malicious” contact with defensive players. This is a safety measure to avoid collisions in which a runner tries to knock the ball out of a fielder’s glove. Batters and base runners must wear helmets at all times. Catchers must wear headgear that includes a helmet, face mask and throat protector and an athletic cup. Bats can't be larger than 33 inches long and 2 1/4 inches in diameter.